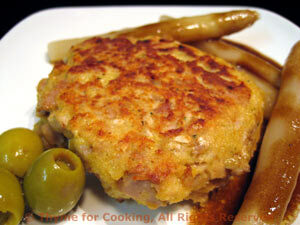 Tuna Cakes, Thyme for Cooking easy first course or light lunch. Carefully turn with a spatula and sauté another 5 - 6 minutes. Remove and place on plate. Divide asparagus between plates and arrange nicely around Tuna Cake. Drizzle with vinaigrette, garnish with olives if you have some and serve. Put all ingredients in a small bowl and whisk well.